I've definitely hit that "winter wall" where I am ready to move on. Ready for tulips to poke their little heads out of the ground, ready to get back to weekly horse riding, ready for local fresh fruits, ready for canning, ready for the chickens to finally get to stretch their legs and explore the whole yard, and just plain ready. I have been trying to enjoy the winter this year, even though I've never been a big winter person. I could happily go straight from fall right into spring, but I suppose winter helps us appreciate spring more? At least that's what I try to tell myself. But I am definitely feeling that spring thaw craving. I went through all my canned peaches within about 2 weeks (note to self - can a TON this year!) and was borderline drooling when I came aross this recipe on A Better Happierthe other day, so I knew I had to make some. Preheat oven to 425°. Combine first six dry ingredients with chilled butter in a food processor and pulse until mixture is a coarse meal. Pour into a mixing bowl and set aside. Add in buttermilk and lemon zest, stirring until just combined. Transfer to a lightly floured surface and form into a ball. Knead the dough about 4 to 5 times, dusting with flour as needed. Roll out a 7" square that's about 3/4" in thickness. Cut the dough in half, and each half crosswise into 4 rectangles. Transfer the 8 pieces of dough to a parchment lined baking sheet. Brush each biscuit with the beaten egg, sprinkling with sugar to finish. Bake for 13-15 minutes until golden brown. 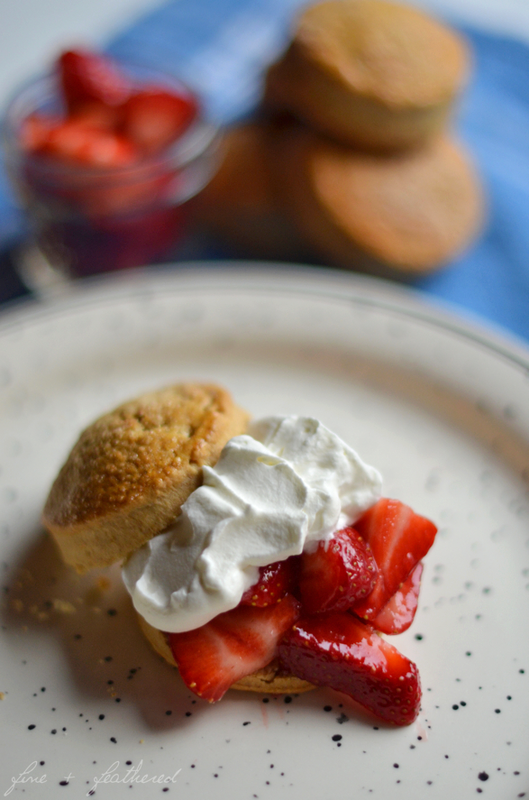 Once cooled, split the biscuits in half and fill with whipped cream and jam. What are you guys doing to stave off those winter blues?